Contante is a money manager that helps tracking the money flow. Contante is a program that I have developed some years ago for our family balance management, suggested by my wife. We are using it from 2002 and we have found it very useful. Now I have decided to publish it as freeware (please take a look to the License.txt file). A clarification before going on: you will find that a couple of function have been never implemented. Why? I just do not need them. Moreover, you may find other things you would like to add/improve. Good, try to ask me for them, but I do not promise anything. I still consider Contante a piece of software developed for my own personal use, and published just to share something that can be useful to other people. Contante is a C++/MFC program. I do not remember exactly which are its requirements, by it should work fine on any non-prehistoric Windows installation (and it still works fine on Windows 10). The program just consists in the contante.exe file. Place it wherever you like, typically “C:/Program files/Contante” and double-click on it to start Contante. Contante automatically registers the “.con” file extension as its own file extension, please check if this conflicts with other programs on your pc before running Contante for the first time. Guess what? Yeah, there is no help file. Contante is quite intuitive and easy to use, almost any button has assigned a short descriptive message that appears in the lower status bar when you place the cursor on it. You should be ready to fly in minutes. However, I will give you some hints based on the way I use it. Contante is a multi-document program, this means you can have more than one “.con” file opened at the same time. One file for your home budget and one for your work business, or one dedicated to the budget planning for your next vacation. I usually start Contante by double clicking on the “.con” file I want to work on, so I do not need having a start menu shortcut. If you want to create a new “.con” file, right-click on the background of the window showing the directory where you want to create the file, then select “new” and “Contante document”. A Contante document is a list of transactions. amount and date: obvious (a positive amount value means an income, a negative one an expense). user: who is responsible for the transaction (me, my wife,…). account: from/to where to money are coming/going (bank, credit card, cash money,…). category: almost obvious (food, home, taxes, car, fun, drugs, clothes,…). description: a piece of text that gives some more details (“cinema: Ice Age”). The values of the user, account, and category fields can be chosen each one from a dedicated list. The possible values of these lists can be edited at any time by accessing the “Options” menu or the dedicated buttons in the toolbar. The transactions are listed in the main area of the window, with the most recent one on top of the list. Each field has its column, plus the last column that shows the partial sum of all transactions from the oldest to the current. 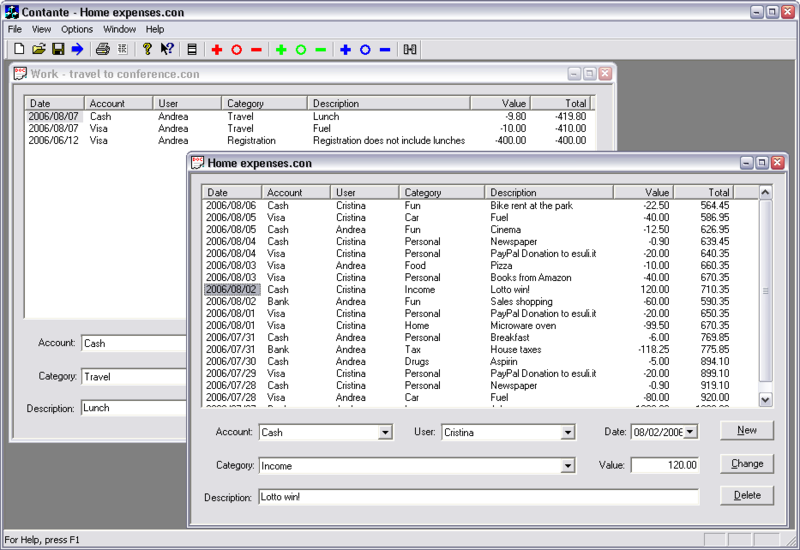 The lower part of interface is used to create, change and delete transactions. When the change or delete buttons are clicked they affect the currently selected transaction. You can select only one transaction at time. If you close Contante with some pending modifications, it will ask if you want to save the documents. An interesting function, at least for me, is the “filtering” function (from the “options” menu, and also in the toolbar). This function allows you to select any combination of subset of fields (users, accounts, categories) and view only the transactions assigned to those fields (e.g. how much I am spending with the Visa?). To select more the one value per field, hold the ctrl key while clicking. No graphics? No, you can “export” (from the “file” menu, and also in the toolbar) the data to a tab-delimited text file. Then you import it into Libre Office and you can have stunning charts. (Yes, you can use Excel too, but why to pay?) Moreover, you can use the export function to move your data to other programs for many other functions (e.g. fill a refund module). That’s all folks. Happy use of Contante.